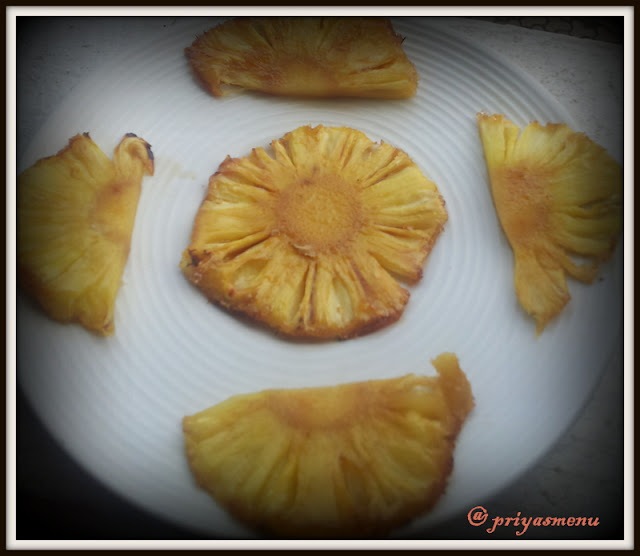 Simple and easy snack, which has a beautiful flop story behind this.... ;) yeah tried making "Pineapple upside down cake" for the first time a few weeks back and messed up with my baking time... The Cake was not that good as I expected but my hubby enjoyed all the baked pineapples in that.... 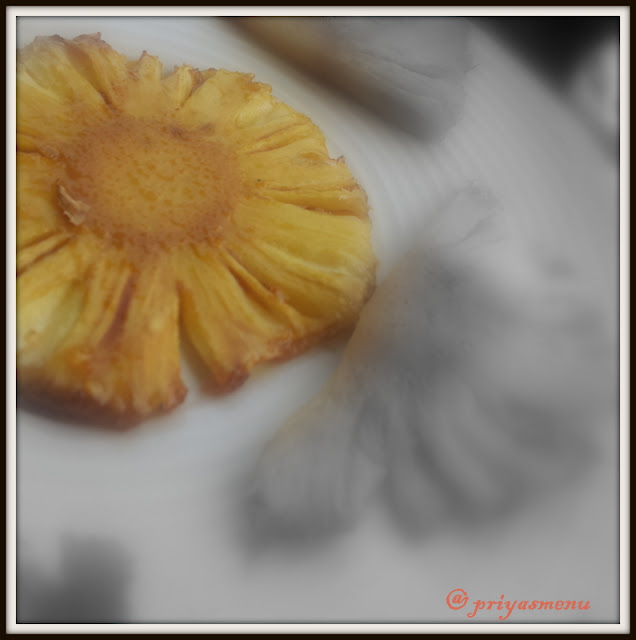 I am not a big fan of pineapple but loved the baked ones.. So next day I tried these baked pineapples with the leftover pineapples..... Really very tasty n delicious.. Now these baked pineapples have became part of our weekly menu!!! Demerara is a light brown, partially refined sugar. Unlike brown sugar, which has the added molasses flavor, Demerara has a natural caramel-like flavor that hasn’t been refined out. This lends warm caramel notes to whatever you add the sugar. Also, Demerara sugar is also referred to as Turbinado sugar in many markets, which has more to do with how the sugar is processed in turbines, than where it originates. To make demerara sugar, sugar producers press sugar cane and steam the juice of the first pressing to form thick cane syrup. The cane syrup is allowed to dehydrate, leaving behind large golden brown crystals of sugar. Demerara sugar is not refined, so it has a rich, creamy, molasses-like flavor which enhances baked goods. The large grains also remain crunchy through cooking, which makes demerara sugar a great choice of sprinkled topping on scones and similar dishes which might otherwise have a uniform texture.Although demerara makes an excellent textural addition to recipes, it should not substitute for certain sugars. Recipes which call for confectioner's or caster sugar should not be made with demerara, since the sugar will have a negative impact on the end texture. Place an aluminium foil in a baking tray. Sprinkle the light brown sugar. Place the pineapple slices on the tray. Bake it for 6 mins in 170 degree celcius. Then turn the pineapple other side and bake it for another 6 minutes. 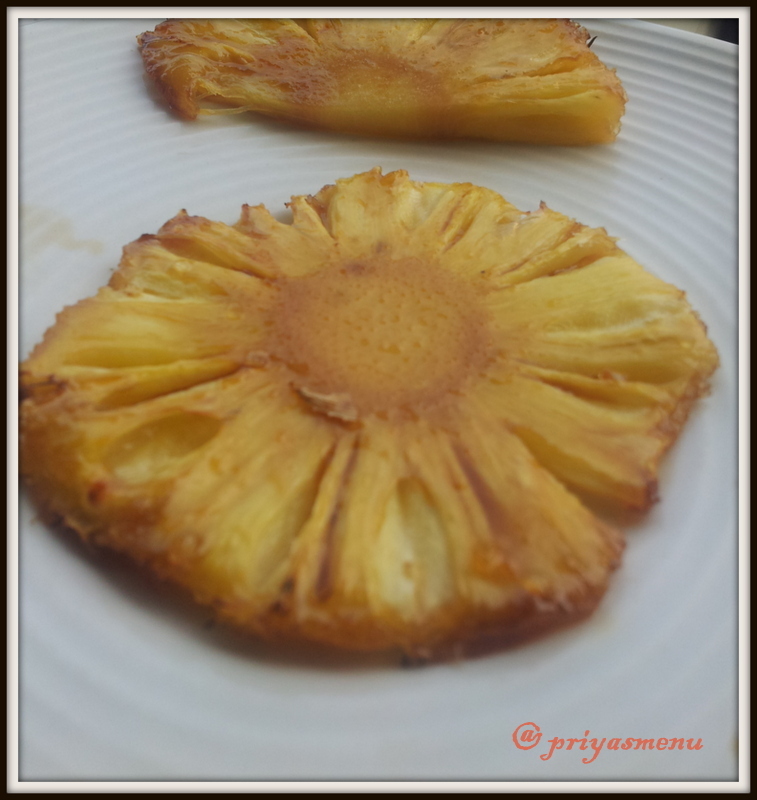 Cook it up with love " Hubby's delight contest "
hey dear.. is your name rekha or priya.. looks like you have changed to rekha in profile..
will try this baked pineapples at home..
Nice and simple and delicious. It is the simple clean food that often tastes amazing rite dear? Belated diwali wishes to you and your family.Baked slices looks fabulous, dont worry flops will always happen, so that we can learn more. Nice and lovely baked pineapples..